Candle making is one of the highlights for most crafting enthusiasts. It’s fun, simple and can produce wonderful items for the home, or to give as presents. Knowing which oils to use is essential (get it, ha ha) in the candle making process. Using the wrong oils can produce odd looking, odd smelling candles which frankly, could look like Frankenstein’s creature. Here, I will discuss the different oils, some tips and tricks and my picks for the best essential oils for candle making. Note: The links above take you to more information, current prices and customer reviews on Amazon. If you do purchase something we get a small commission, which has absolutely no effect on the eventual price that you pay. When making candles, there are two different oils you can use. These are, fragrance oil and essential oil. Need to know the difference? Both oils have their pros and cons. Essential oils do have the added bonus of therapeutic properties, which is highly sought after. Some essential oils are not recommended for certain people in the house, such as: pregnant women, some allergies and elderly people. Lemongrass with geranium for a longer lasting fragrance. Cinnamon and clove produce a pleasant smell. Rosemary and peppermint create an energising effect. Cedarwood and sandalwood can make a woody scent which is reminiscent of a log cabin. There are hundreds of more combinations; take care, there is a science to this. Sun Essential Oils have created a highly reviewed and rated product. This large 4 ounce bottle will make a fair few candles. You can buy this brand in larger bottles, just be prepared to pay more. 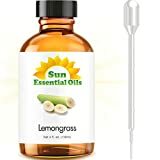 Lemongrass is a great oil to use for its cleansing properties. It’s often used for use as a skin healer, as it has antiseptic uses. When used in candles, the scents can freshen the air and cleanse its surroundings. The price is pretty good for the size bottle you get. This undiluted, no additives essential oil is a fragrance which can have many benefits. Gya Labs have produced this 10ml ounce bottle of orange. The scent released will be sweet, so use a limited amount if this can make you feel sickly. 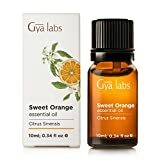 Sweet Orange essential oils are the most commonly used with aromatherapy. Its therapeutic benefits can include sedative, rejuvenating, antiseptic and moisturising properties. As there are so many benefits, this essential oil is a little more expensive than others; but it will be worth it. Citrus Sinensis - Citrusy, bright clean scent with sacchariferous undertones of zesty orange peels. Great mood lifter with its vibrant hues of refreshing aroma which strengthens positive vibes. Protects your delicate skin against harsh climate changes with its supple moisturizing effects. Rich in free radicals and limonene, it acts as a potent immunity enhancer & clears skin acne. Apply few drops into personal care products for best efficiency on skin or dilute with carrier oils for relaxing massage. For aromatherapy uses, add several drops into Gya Labs diffuser. Lavender is another commonly used essential oil, used in aromatherapy for its calming nature. This may be why Naturenics have used lavender to make a high quality product. The high price tag may raise a few highbrows, but you get 30ml in each bottle. Most people have used lavender in some way, either by planting it outside, using it in hot water bottles or putting a few drops on their pillow before bed. Lighting a candle for an hour in the early evening, should calm you down. Lavender slows the mind, eases the senses. Perfect for those who struggle to sleep, or unwind from a busy day. 100% PURE LAVENDER ESSENTIAL OIL: Many "lavender oils" on the market don't contain any lavender at all. Instead they use linalyl acetate, an artificial compound that smells similar without the aromatherapy benefits. Don't get caught out, get the real thing. Pure Certified, No Harmful Chemicals, No Sulfates, No Parabens, Gluten Free. ULTRA CONCENTRATED FOR MAXIMUM EFFECT: You'd be shocked if you saw how much lavender flower is squeezed into this little bottle. A high concentration means a deeper, more potent aroma and stronger therapeutic grade effects. It also means your bottle will last much longer. DO YOU SUFFER FROM STRESS, ANXIETY, INSOMNIA or DEPRESSION? : Aromatherapy with our diffuser ready real Bulgarian lavender essential oils can help you relax providing peace & calming effect while having the deepest and most restful sleep ever. It also reduces stress, anxiety, improves your sleep, helps lift your mood, and clear your mind. A Natural treatment for your migraines and headaches. REWARD YOURSELF WITH A RELAXING MASSAGE: Relives pain, improves flexibility, treat muscle pain, increases blood circulation, lowers blood pressure, reduces tension in muscles, providing detoxifying & antioxidant support. Our Customers Love to Make their own specific Lotions for Skin, Face, Soaps, Scrubs, Shampoo, Candles, Lip Balm & much more. 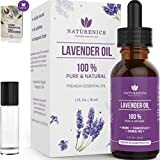 SUPERIOR BUNDLE : Our complete package is best value for your money it comes with Pure Organic Lavendar Essential Oils 1 Fl Oz, Glass Dropper, Glass Metal Roll On Bottle & an eBook to help you understand powerful natural benefits Essential Oils has to offer. Don't forget to buy this as a PERFECT GIFT for your family & friends. Benzoin is an interesting one; you may or may not have heard of it. For anyone with skin irritations or cleansing problems, this is the essential oil for you. To get that beautiful skin looking as radiant as ever, try Benzoin. It does have added benefits including antidepressant, antiseptic, anti-inflammatory and relaxant properties. Essential Trading Post have put forward a 30ml bottle for an impressive price. Description: The Benzoin tree originates in Java, Sumatra and Thailand where it can grow up to 8 meters (20 feet). Deep incisions are made in the trunk of the tree from which the grayish color sap exudes. When the resinous lump becomes hard and brittle, it is collected from the bark. Essential Oil Labs is a USDA certified organic bottle. This 15ml bottle is ideal to try out, peppermint can be a strong fragrance, try small drops first. This is natural, undiluted, no toxins and no additives. 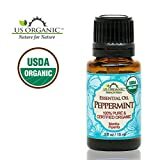 Peppermint essential oil has a multitude of benefits, the foremost being it smells pretty awesome when lit as a candle. It is often used to treat stomach ailments such as indigestion. Lighting a peppermint candle, taking deep breaths in the room and inhaling the scents can help to calm, reduce inflammation and generally help calm. Which essential oil is perfect for your own candles? Well, it depends on several items. Do you just want nice smells in the home, nice colored candles? Or do you care about the health benefits involved? Whatever is your choice, read the differences and decide what is important to you. My personal favorite would be the Benzoin. I live a busy life and need to relax. Benzoin smells pleasant and calms me down in the evenings for a pretty good price.